The 30th College All-Star Game on August 2, 1963 did not appear ahead of time as if it would offer much of a contest. Most of the All-Star Games had been won by the defending NFL Champions, and in this instance it was Head Coach Vince Lombardi’s Green Bay Packers taking the field, having won their second straight league title in ’62. Green Bay had a powerful lineup, with QB Bart Starr (who tossed five TD passes in the previous year’s 42-20 shellacking of the All-Stars), FB Jim Taylor, and an outstanding line on offense and a defense that included future Hall of Famers in DE Willie Davis, DT Henry Jordan, CB Herb Adderley, and safety Willie Wood. However, star HB Paul Hornung had been suspended for gambling and would not be appearing in the offensive backfield. The Packers were also without another future Hall of Famer, MLB Ray Nitschke, who was injured, and Taylor was playing with a bad knee. The All-Star team that was facing the Packers, coached for the sixth straight year by Otto Graham, contained many future pro stars that included Ohio State OT Bob Vogel; G Ed Budde from Michigan State; linebackers Dave Robinson from Penn State (who would play for Green Bay), Lee Roy Jordan out of Alabama, and Minnesota’s Bobby Bell; and UCLA safety Kermit Alexander. The player who started at quarterback and ended up being the star of the game, however, wasn’t even drafted by a NFL club. 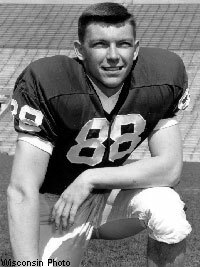 Wisconsin’s Ron VanderKelen (pictured above) had been passed over in the draft (held on Dec. 3, 1962), but after a brilliant performance in the Rose Bowl he became a hot commodity and was signed by the Minnesota Vikings (the New York Titans – soon to be Jets – had taken him in the 21st round of the AFL draft). Of the four quarterbacks on the All-Star roster, VanderKelen was selected to start by Graham. There was a crowd of 65,000 in attendance at Soldier Field for the Friday night game. It seemed like business as usual when Green Bay scored in the first five minutes of the contest. Boyd Dowler, punter for the Packers as well as starting flanker, had put the All-Stars in a hole with his kick to the eight yard line. Iowa HB Larry Ferguson fumbled the ball away and the Packers recovered at the 11. Jim Taylor scored from six yards out for the early lead. The All-Stars responded with a 57-yard drive highlighted by VanderKelen throwing to ends Paul Flatley from Northwestern and Miami of Ohio’s Bob Jencks, as well as the running of Ferguson. Jencks finished it off with a 20-yard field goal. Late in the first quarter, CB Tom Janik from Texas A & I intercepted a Bart Starr pass and returned it to the Green Bay 27. A VanderKelen throw to end Pat Richter (pictured below), who had been a teammate at Wisconsin, gained 21 yards to close out the opening period. Ferguson opened the second quarter by blasting five yards into the end zone and Jencks added the extra point as the All-Stars took the lead by a 10-7 score. The Packers came back with a 59-yard drive, mostly behind the running of Taylor and HB Tom Moore, who had a 27-yard carry along the way, and ended up with a 21-yard Jerry Kramer field goal. The All-Stars had a chance to add to their lead with a field goal of their own before the half, but a 19-yard attempt by Jencks was unsuccessful after being deflected by Herb Adderley. The score remained tied at the midway point. There was no scoring in the third quarter with Mississippi QB Glynn Griffing in for VanderKelen. But, after the All-Stars recovered a fumble, Griffing passed the All-Stars down the field. The collegians were also aided by the running of Nebraska FB Bill Thornton and Washington HB Charlie Mitchell along the way. Jencks booted a 33-yard field goal to cap the 63-yard drive that put the All-Stars back in front at 13-10. The Packers missed a scoring opportunity when Kramer was wide on a 37-yard field goal attempt. It set the stage for the game’s pivotal, and most sensational, play. VanderKelen, now back in for the All-Stars, threw 20 yards to Richter who pulled in the pass near the sideline and ran the rest of the way for a 73-yard touchdown. The Packers were in a ten-point hole with time running short. Green Bay did score once more, driving 63 yards - mostly through the air - and Taylor pounded in from the one yard line, but there were only six seconds left and the All-Stars came away with a stunning 20-17 win. The crowd erupted once the final gun sounded and VanderKelen was carried off the field by his teammates. The All-Stars had more first downs (16 to 15) and both out-rushed (141 to 96) and out-passed (183 to 119) the Packers. Each team suffered an interception and fumbled the ball away once. Green Bay was penalized for 77 yards to just 13 lost by the All-Stars. Ron VanderKelen, the All-Star MVP, completed 9 of 11 passes for 141 yards and a touchdown. Glynn Griffing was successful on 6 of 10 throws for 42 yards. For the Packers, Bart Starr completed 19 of 32 passes for 169 yards. Jim Taylor, playing hurt against an aggressive All-Star defense, gained 51 yards on 16 carries. The Packers narrowly missed finishing atop of the Western Conference once again in the ensuing NFL season, going 11-2-1 to end up second to the Chicago Bears. Ron VanderKelen went on to play five seasons with Minnesota, and while he occasionally competed with Fran Tarkenton for the starting job, he was strictly a backup quarterback as a pro. Given an opportunity to start in 1967, he was quickly supplanted by Joe Kapp and finished up with a year in the CFL. He was never able to replicate his fine Rose Bowl and College All-Star Game performances in the NFL, but he led the All-Stars to perhaps the greatest upset in the history of the series. The win for the All-Stars was the first since 1958, and the ninth (and last) of the series that was dominated by the pro teams, who won 31 of the games (there were two ties).